Gordo’s Taylor Clegg gets a hit during the Lady Wave’s 7-5 win over Lamar County on Saturday, March 9th. The Lady Wave picked up a much needed win over Lamar County on Saturday, March 9th at home. 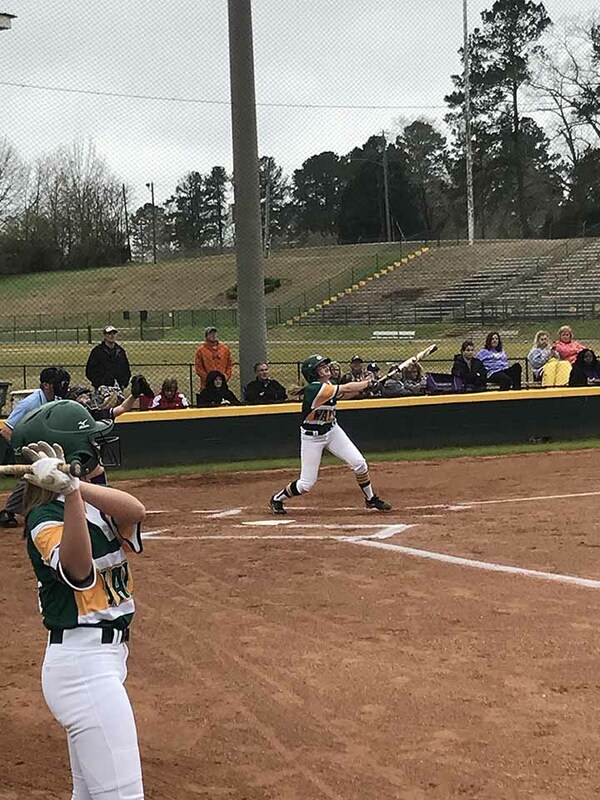 In a day where Gordo opened a double-header with Bibb County at 9 a.m., an 11-1 loss, Gordo was able to pull off a 7-5 win over the Lady Bulldogs in the afternoon. Gordo would take a 2-0 lead in the bottom of the first inning when Bethany Vintson singled on a hard ground ball to left field, sending Taylor Clegg and Ansley Wells across home plate. On the next at-bat, Anna Kate Dykes doubled on a fly ball to right field to score Lilly Sutton and Carlee Criswell for a 4-0 advantage. Lamar would answer in the top of the second, however, as the Lady Wave would allow three runs to make the score 4-3. In the bottom of the second, Halli Koon would sacrifice and reach base on an error, as Clegg scored to push the lead to 5-3. Sutton would ground out on the next play, but Wells and Koon both scored to give Gordo a 7-3 lead after the second inning.